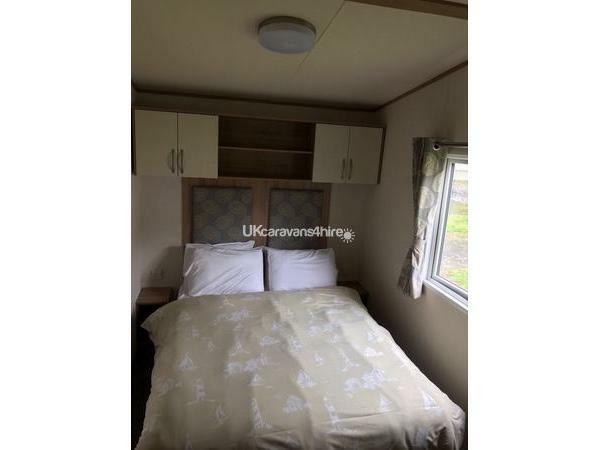 A £100 deposit is taken at time of booking, £50 is non refundable to secure the booking and the other £50 will be returned at the end of the holiday, once the caravan has been cleaned and checked for any damage. The remainder of the balance to be paid 4 weeks before arrival date. 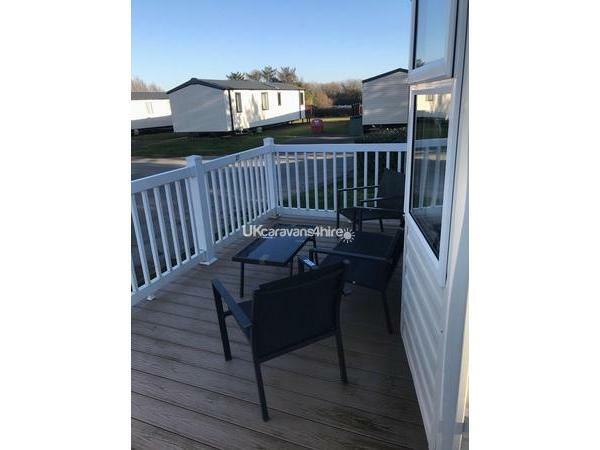 Hafan Y Mor Holiday Park is a great place for a caravan holiday. 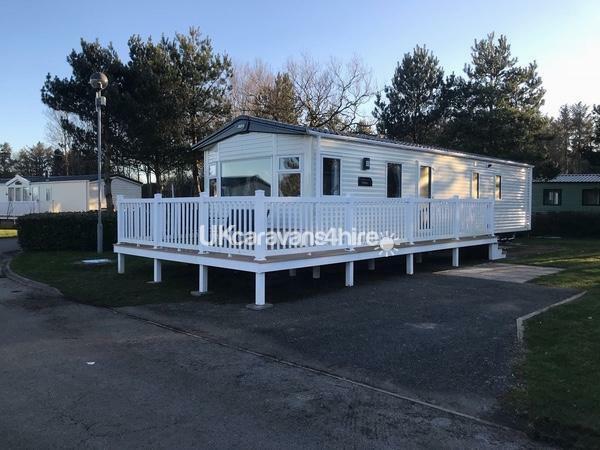 A lovely modern and spacious caravan with private decking wth a view of the fishing lake, yet only a short walk away from the local amenities. Take a stroll along the beach, or if it's action you prefer then take a splash in the newly refurbished Splash Zone where you can enjoy a leisurely swim or have fun on the flumes. Please note passes aren't included but can be purchased at reception. We provide duvets, pillows and sheets, top covers to be provided by guests. Another fabulous stay!!! Spotlessly clean, great location and everything you could possibly need for a family holiday. We had the best time in the caravan. It was absolutely spotless and had everything we needed for a comfortable stay. In terms of location on the park, I think this plot would be difficult to beat... it was just the right balance between being peaceful and yet only a short walk to the amenities. We loved how close it was to the beach!! Lauren was an absolute pleasure to deal with throughout the booking process... very friendly and professional. One thing we weren't expecting which was a nice touch was a fan in the living area to keep us cool in the hot weather... we thought this was a simple but really nice touch to make sure we had a comfortable stay. We're already planning our next stay!! Absolutely fantastic holiday was has by all. Lauren was a pleasure to deal with. Easy to get hold of and communication was good throughout the whole booking process and she even asked if we had a nice holiday afterwards which I thought was really lovely. Caravan was spotless and had everything that we would need for our stay. We felt comfortable and at home straight away. 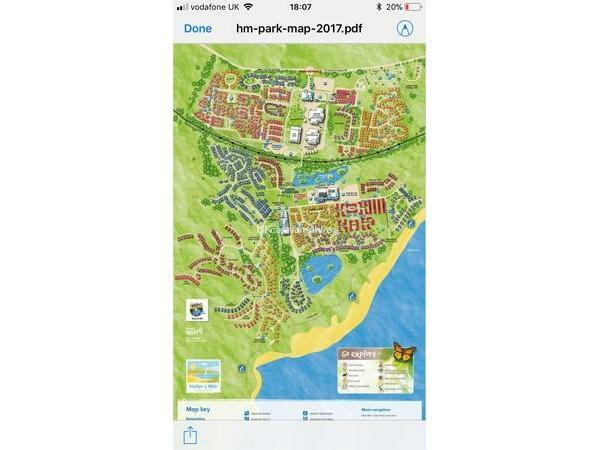 Facilities on the park were outstanding and in easy walking distance from the caravan even with a reluctant 3 year old. We will be booking again for next year. Cannot recommend enough!!!! couldn't have picked a better person to book with. Lauren was a pleasure to deal with from the first contact, the accommodation was brilliant, wasn't too far from the main site either. definitely recommend and definitely would rebook. 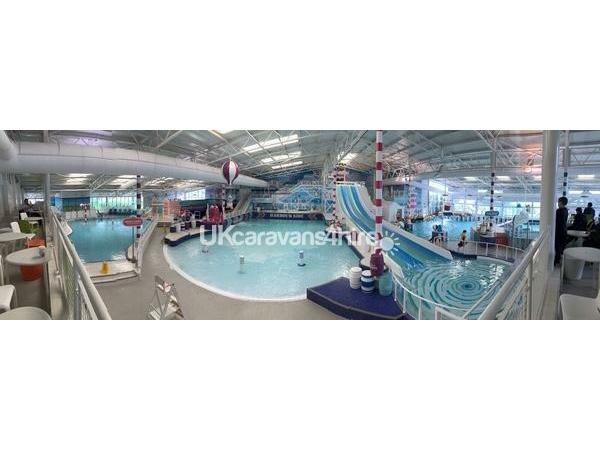 We had an amazing 4 nights stay at the caravan. We were all really comfortable in there and it had everything we needed. Can't wait to go again. Grandparents, parents, daughter and granddaughter all stayed in this loverly modern caravan and we had a great time. It was comfy, clean and well kitted out, with plenty of space and also with two w.c.'s, one with a nice large shower. It was just far enough away from the facilities to be lovely and quiet, with only a few minutes easy flat walk to reach them. The caravan was close to the rock gardens which where beautiful and great to explore. Lauren was a pleasure to deal with right from the start and made the whole process of booking and sorting payments out real easy. Many thanks, we had a great family holiday. As our first family holiday, the caravan site was perfect for out three young children. It was beautiful inside, clean and spacious; and we wouldn't hesitate to use it again! 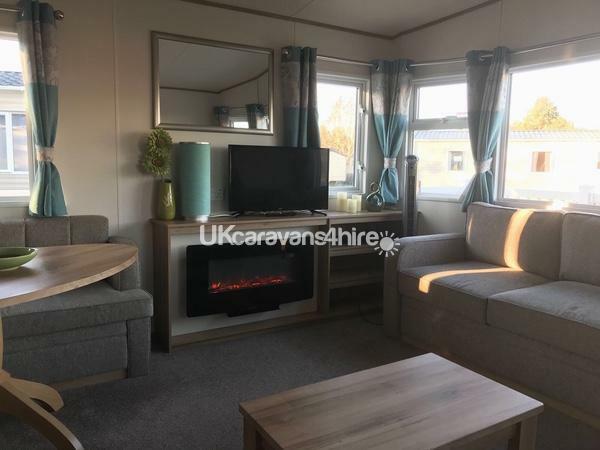 Booking of the caravan was straightforward and the owners were very helpful and friendly. Many thanks for the most wonderful first holiday! 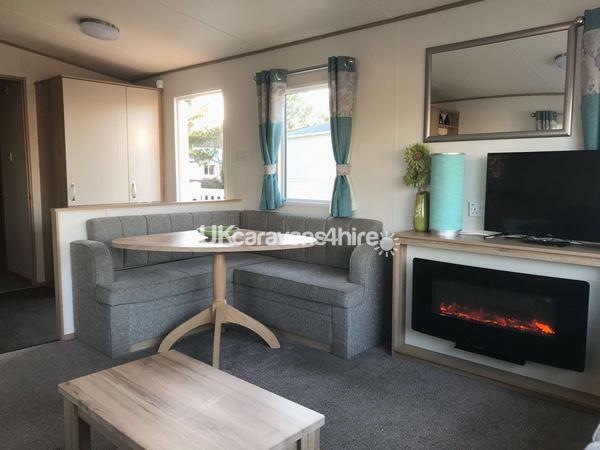 My husband and I have recently stayed in this caravan with our 1 year old daughter for a short break. The caravan was lovely! Very spacious, clean and comfy. The van is based in a quiet part of the park with only a short walk to the main facilities, so for us this was a fantastic spot. Lauren was brilliant to deal with, very helpful from the beginning to the end, making the whole booking experience nice and easy. I would definitely recommend this caravan and would happily stay here again. Thank you for a lovely holiday! We stayed in the caravan with our friends and all our kids so there were 8 of us in total. Was a bit worried about feeling squashed but we weren't at all. 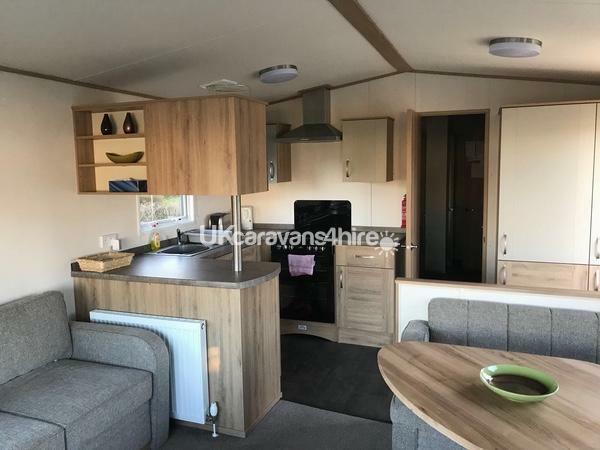 The caravan felt very spacious even with 3 young Children and a baby. It was clean and comfy and in a quiet part of the park but close enough to the swimming pool etc so that it wasn't too far for the children to walk. The caravans weren't all squashed together which meant that the children had space to run around outside aswell. An added bonus were the morning visits from a family of ducks! Lauren was great to deal with from the start and made the booking really easy. We will definitely go back and will be recommending to friends! Thanks So much! Thank you for a lovely review Emma. Looking forward to having you back next year. We stayed here for a short stay earlier this month and it was an absolute joy to stay in far enough away from the facilities in a lovely quiet spot. Close by to the rock gardens for a morning walk to walk to wake up!! We had small children and the distance from the pool was great they didn't have to walk too far in the evenings after a fun filled day either! Ben and Lauren were a pleasure to deal with right from the start!! Thanks for an amazing family holiday!! !